United Nations Ambassadors Vasily Nebenzya of Russia, left, Liu Jieyi of China, center, and Nikki Haley of the U.S., right, confer after the United Nations non-proliferation meeting on North Korea, Sept. 4, 2017 at U.N. headquarters. China says it will support the United Nations taking further measures against North Korea in response to its latest nuclear test. "Given the new developments on the Korean peninsula," Foreign Minister Wang Yi said Thursday during a news conference in Beijing, "the U.N. Security Council should respond further and take necessary measures" to deal with the crisis. But Wang also stressed that "sanctions and pressure" must be go hand in hand with "dialogue and negotiation" with Pyongyang. China is North Korea's biggest diplomatic and economic ally, and contends that tighter sanctions against Pyongyang will do little to ease tensions on the Korean peninsula. At the White House Wednesday, U.S. President Donald Trump said "we will see what happens," when asked whether he would approve military action against North Korea, adding "that is not the first choice." Trump spoke following a telephone call with China’s president, Xi Jinping. A flurry of conversations among regional and world leaders about North Korea has been prompted by Pyongyang exploding what it says, and several international experts concur, was a hydrogen bomb at its Punggye-ri nuclear test site on Sunday. Japanese Prime Minister Shinzo Abe and South Korean President Moon Jae-in joined forces Thursday in calling for further diplomatic and economic pressure to be placed on the socialist regime. The two leaders, meeting on the sidelines of an economic summit in the eastern Russian port city of Vladivostok, said they would increase their efforts to persuade China and Russia to back a harsh new round of sanctions on Pyongyang. FILE - United Nations U.S. Ambassador Nikki Haley addresses a U.N. Security Council meeting on North Korea, Sept. 4, 2017 at U.N. headquarters. 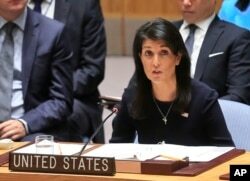 The United States has circulated a draft of a new U.N. sanctions resolution about North Korea to Security Council members, pushing to get it to a vote next Monday. The draft, obtained by VOA, calls for the ban on the sale of oil, as well as refined petroleum products and natural gas liquids to North Korea. Pyongyang imports nearly all of its oil and gas from China, and without it, experts say the economy would quickly be strangled. The U.S. draft also aims to cut off exports of North Korean textiles, which account for hundreds of millions of dollars in annual revenue. It also seeks to tighten restrictions on North Korea’s ability to send its citizens to work in foreign countries, where they often are required to send their salaries home to the government. Russian President Vladimir Putin has joined with China in opposing sanctions on the North, insisting that negotiations are the only means to resolve the issue. Both nations have pushed a compromise that calls for Pyongyang to give up its weapons program, in exchange for an end to the joint U.S.-South Korea annual military drills. 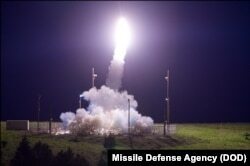 Meanwhile, South Korea went ahead with its plans Thursday to deploy the remaining pieces of a controversial U.S.-built missile defense system to counter a possible missile strike from North Korea. A convoy of trucks transported four rocket launchers that make up the Terminal High Altitude Area Defense (THAAD) to a former golf course in the southern city of Seongju, were they will be installed alongside two launchers that are already operational. The convoy, accompanied by 8,000 riot police, had to break through a gauntlet of 400 protesters who had staged a sit-in on the road to the THAAD deployment site. 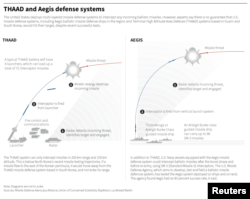 Experts say there is no guarantee that U.S. missile defense systems, including Aegis ballistic missile defense ships in the region and Terminal High Altitude Area Defense (THAAD) systems based in Guam and South Korea, would hit their target. Residents and activists have raised worries over rumored health hazards linked to the system’s powerful radar and the possibility the town will become a target of North Korean attacks. China and Russia also oppose the deployment of the THAAD system in South Korea, citing their respective national security concerns. Beijing lodged a formal protest with Seoul Thursday over the added THAAD components. U.N. Correspondent Margaret Besheer contributed to this report.